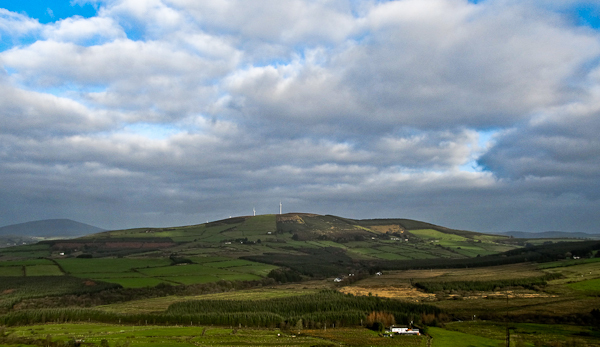 Knockastanna is the 754th highest place in Ireland. Park at the forest entrance R85087 56394 A room for 4-5 cars.There is more parking on the left approximately 200 meters to the north. Hop a locked gate and walk directly uphill on the forest track until it swings right. Leave the forest track and continue uphill eastwards through the trees following a rough machine track. As the trees begin to thin exit the forest northwards aiming for the lowest windmill. This will bring you onto the windfarm road above the caretakers bungalow. Follow the road uphill to the fourth and last windmill. The summit is on the high mound just behind the windmill.